For this month’s Blog Hop Wednesday started by Radhika, I was paired with Priya of Mharo Rajasthan’s Recipes. She has a wonderful collection of authentic Rajasthani recipes and I was delighted to go through her recipes. I wanted to try out a sweet from her recipes. 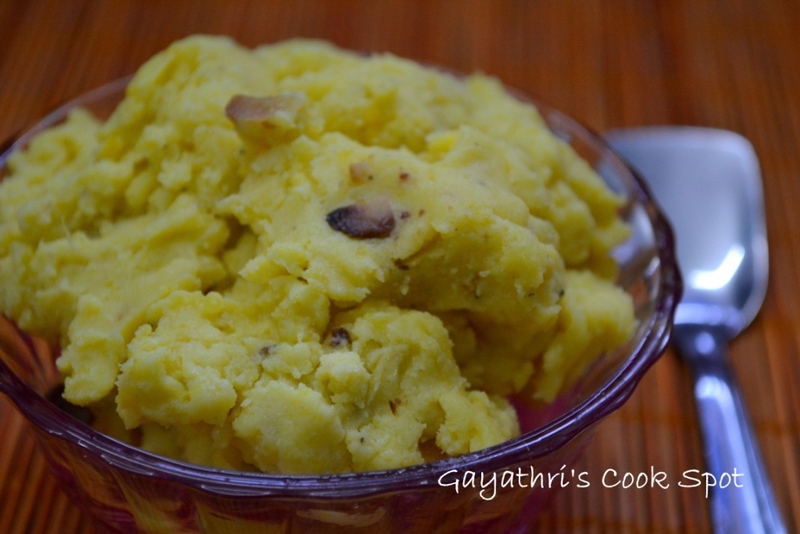 Moong dhal halwa has been in my list for long and so when I saw recipe, I wrote it down. The halwa was very delicious.Adding khova made it very rich. As I didn’t have khova, I boiled a litre of milk, reduced it and added it to the halwa. I slightly modified the method of preparation but the result was very nice. Thanks Priya for the nice recipe. 1. Soak moong dhal for 2 hours. 2. Bring milk to boil and reduce it to half. 3. Add this milk and grind the dhal to a fine paste. 5. Heat ghee in a non stick pan and add the prepared paste to it. 6. Continuously stir the mixture to avoid formation of lumps. 7. When the mixture reduces to a thick mass, add sugar and cardamom powder. 8. Soak a few strands of saffron in hot water and add it to the halwa. 9. Add a few drops of yellow food colour and mix well. 10. Heat 1 tsp of ghee and roast the broken cashew until golden. 11. Add it to the halwa and cook until the halwa no longer sticks to the pan. Halwa looks yummy!!! I always wanted to try this.. This is a nice thing to do. Blog hopping. The halwa turned out fine. Nice one, love the color of your halwa.You have tempted me to try this recipe, so noted it down for my “To-try” recipe list. Looks so good, should have tasted great..
tasty and delicious one !! Aromatic Halwa!! Adding khoa sounds good!!!! Looks delicious!!! I want to dig in.